When Evan Lysacek and Johnny Weir qualified for the 2006 Olympic Winter Games in Torino, Italy, Jeremy Abbott was not even eligible to compete for a spot on the Olympic team. He had failed to qualify for 2006 national competition. Then he began to turn things around. “That was kind of a starting point for me and everything that has happened since then,” Abbott said. In those four years, he rearranged his whole life in pursuit of a spot on the 2010 U.S. Olympic team. The hard work came to realization Sunday when a breathtaking performance not only put him on the team but also vaulted his stature as a medal contender in Vancouver. 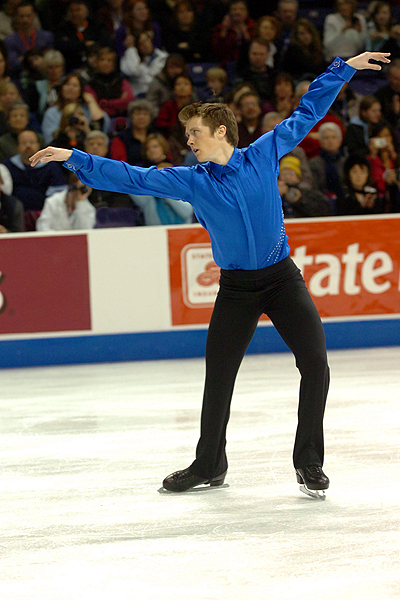 At the 2010 U.S. Championships in Spokane, Wash., Abbott won his second consecutive national title in dramatic fashion, scoring a personal-best 263.66 points that made him look like he was in a different league than Lysacek (238.63) and Weir (232.09), who despite their mistakes, also made the cut for Vancouver. “This is the best performance I’ve ever given, but I know I’m capable of so much more,” Abbott said. He could not miss from the time he hit his opening quadruple toe to his program-ending spin. One by one, he landed the big tricks. The celebration will be short for Abbott. With the gold medal tucked into his carry-on bag, the 24-year-old heads home to the Detroit Skating Club on Monday, and will soon come up with the Vancouver game plan with his coaches, 1994 World Champion Yuka Sato and two-time U.S. Pairs Champion Jason Dungjen. Abbott began working with Sato and Dungjen this summer after spending a decade working with Tom Zakrajsek in Colorado Springs, Colo.
Abbott moved from his mom’s house in Colorado Springs to the Detroit suburbs after a disappointing performance at the World Championships last year. He was the national champion but his 11th-place showing ranked him the lowest of all three Americans. Lysacek, meanwhile, usurped Abbott’s role as the top American male skater by claiming the world title. The story was a little different for Lysacek. He fell on his opening quadruple-toe attempt, receiving only one point for the move, as he also under rotated it. He had other minor slip ups as well. It was the first time this season Lysacek attempted a quad in his program. In fact, he won the world title without performing a quad. “I’m saving my Olympic skate for the Olympics,” Lysacek said. He can be comforted by the fact that the U.S. Champion has rarely come out on top at the Olympic Winter Games. Even in 2006, he was the silver medalist but finished fourth overall, one spot ahead of national champion Weir. Timothy Goebel earned the 2002 Olympic bronze medal when he was second at nationals (behind Todd Eldredge). Weir finished fifth in the free skate in Spokane with a technically empty performance. On his opening jump, the triple flip, he received a deduction for the wrong takeoff edge, and he later turned a planned triple Axel into a single. The U.S. team should be very strong in Vancouver, although there will be plenty of tough international competition, mainly from Canada’s Patrick Chan, Russia’s Evgeny Plushenko and France’s Brian Joubert. One of the U.S. men who just missed a chance to compete in Vancouver was Ryan Bradley. He handed in the second-best free skate of the competition, complete with an opening quadruple toe and a quad toe-double toe, to pull up to fourth overall. His free skate was exceptional, but his sixth-place short program, in which he performed the quad but doubled two of his planned triple jumps, cost him a spot on the Olympic team. “Because I do the quad, I think it should be worth more, probably like 100 points,” Bradley joked. The back-to-back quads earned him over 21 points but were just a small portion of what made the program successful for him. The packed crowd at Spokane Arena laughed at the quirky choreography throughout. Minutes later, the fans showed their appreciation for Bradley, jumping to their feet before the music ended.